Geoffrey Chaucer’s Canterbury Tales—the most celebrated literary work of medieval England—portrays the culture of the late Middle Ages as a deeply commercial environment, replete with commodities and dominated by market relationships. However, the market is not the only mode of exchange in Chaucer’s world, or in his poem. In Chaucer’s Gifts, Robert Epstein reveals the complex gift economy at work in the Tales. 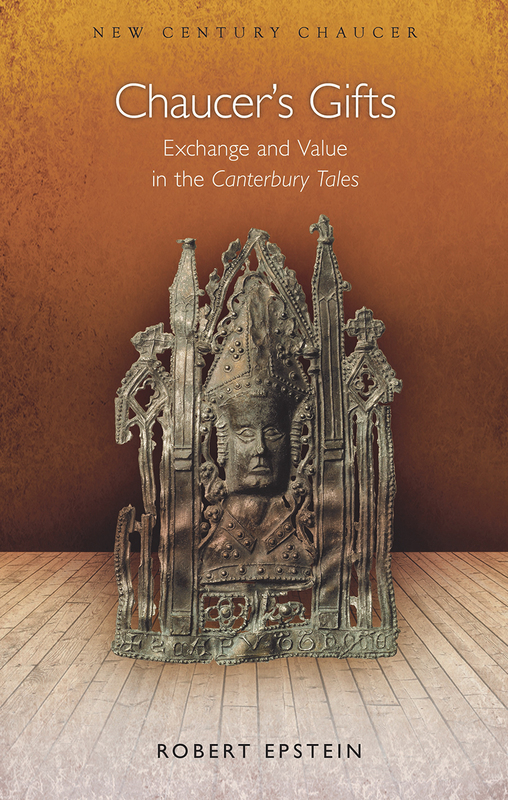 To explain the network of exchanges and obligations found in the Canterbury Tales, Epstein applies recent advances in gift theory and introduces economic anthropology to medieval literary criticism. He makes the case that the world of the Canterbury Tales harbors deep commitments to reciprocity and obligation that are at odds with a purely commercial culture. Drawing on critiques from some of the most influential anthropologists and theorists, such as Pierre Bourdieu, Jacques Derrida, and Marilyn Strathern, Epstein shows that the market and commercial relations are not natural, eternal, or inevitable—an essential lesson if we are to understand Chaucer’s world—or our own. "In this major study, Robert Epstein expertly and nimbly draws on (and intervenes in) gift theory to overturn a long tradition of Canterbury Tales criticism, demonstrating that, for Chaucer, social relations were not inevitably structured by the market – and neither are they for us. In this way, Epstein not only provides a more profound appreciation for the imaginative scope of the Tales, but also a more expansive grasp of social possibilities for the present." "Deploying a wide range of anthropological theory rarely put before literary critics and students, Chaucer’s Gifts unravels the critical assumption that The Canterbury Tales is dominated by the values of emerging Western commercialization. As an alternative, Epstein demonstrates how a more complex understanding of gift-exchange and social obligation is necessary to appreciate Chaucer’s many-sided perspective. This book is an important contribution to the growing number of studies reassessing late-medieval literature’s place in its economic settings, and an eloquent argument for using premodern literature to see in new ways the origins, paradoxes, and blindness of modern neo-liberal assumptions." "Engages in depth with a variety of theories of the Gift going back to Marcel Mauss, including those of theorists (familiar to literary study) Pierre Bourdieu and Jacques Derrida, but also incorporating much more recent thought in anthropology from a variety of sources, especially David Graeber. Along the way, Epstein provides a thoughtful reading of the Canterbury Tales, and a valuable corrective to many economic approaches to Chaucer's work."